Do you open up your e-mail and find countless new messages? If you belong to a few list serves or online groups, the daily chatter can sometimes be overwhelming. Also, if you shop online, the websites you use like to fill your box up with lots of advertisements and sales. An easy way to deal with those pile ups is to set up folders to receive the messages according to sender, and to create a "rule" to automatically place incoming messages into the appropriate folder so you can deal with them later. If you have one person who constantly sends you jokes or other forwarded messages, you can create a rule for messages from that person and you can review these message when/if you have time. Here is a screen shot of my folders that I set up in my Inbox. I use Microsoft Outlook 2007. 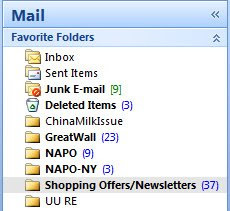 Shown are folders for several list serves that I belong to, and a categoryI created for Shopping Offers/Newsletters and other stuff (non-urgent items which I can review and discard in bulk at a later time). Here are the basics on how to do it, using Outlook 2007. This information was obtained from the following link on www.office.microsoft.com . If you follow the link, you will see additional information on other variations of creating rules. Using Google G-mail? G-mail uses labels instead of folders, and filters instead of Rules. Click to learn about Labels and Filters. Using Yahoo Mail? Click here to learn about Filters. I also create folders for items that I need to keep or follow up on and manually move messages into them. I will expand on those folder uses next month. Wishing you all a very Happy and Healthy Winter Holiday Season and a Happy New Year! You may unsubscribe from this tip by sending me an e-mail with “remove from list” in the subject line.